"Please stay connected. Priority transfer in progress. 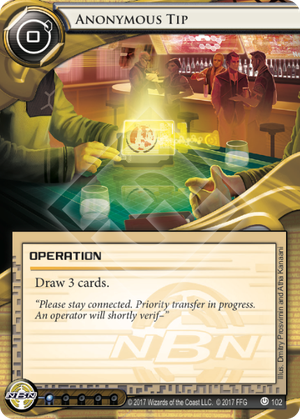 An operator will shortly verif-"
When Netrunner was young Anonymous Tip was considered a bad card. The corp already got a free draw, and accelerating their draw not only increased the density of agendas in RD but also headed the corp closer to running out of cards. Have you ever wondered why Anonymous Tip almost never sees play but its runner-counterpart Diesel is used often (in and out of RCS)? Yeah, me neither. The answer is quite simplistic - drawing a card has more marginal value to the runner than the corp. The biggest reason, of course, is that the corp player already has a mandatory draw every turn while the runner needs draws to get their rig set up quickly and sway the game state in their favour as turns go on. Meanwhile, the corp player isn't fishing for more draws, but more of that $$ to power their ICE, rez their assets, and advance their agendas. In addition, a runner using Diesel can at worst get dead draws and end up discarding them at the end of their turn. For a desperate agenda-flooded corp, an Anonymous Tip into 2 more agendas is the last thing they want to see. At the end of the day, it confuses me why they even made this a faction-specific card if not only because of Diesel getting the green light. There's no evident or immediate synergies with the rest of the NBN suite so maybe Jinteki might find some use for it to set up Celebrity Gifts. At least, it's a point of influence cheaper than its counterpart.